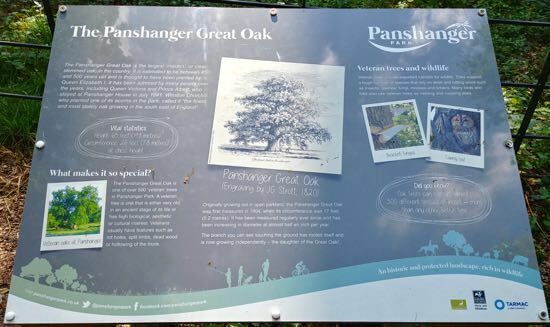 This is an excellent walk through Panshanger Park. It's an undulating, varied, and fascinating stroll through former parkland, a walk along a rare chalk river (one of only 180 on the planet), quarries now taken over by nature, some historical remains from the former country estate, and a visit to the largest 'maiden' or clear-stemmed oak in the country, which is thought to be more than 500 years old. This is a lovely walk in a well-maintained reserve. 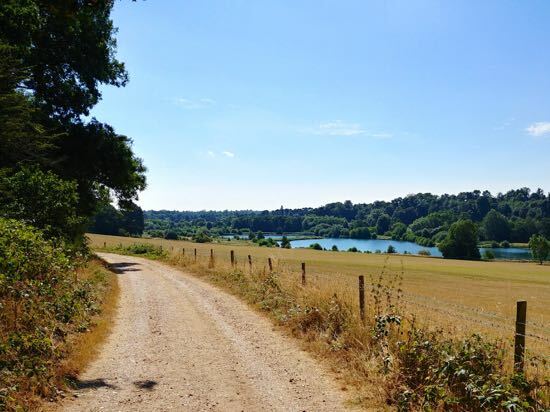 Don't be put off by any concerns about noise from the A414; Panshanger Park is so absorbing that you will soon forget about it. There are two points when the tracks meander close to the road, but you soon move away and totally forget about cars. Park in the car park at Panshanger Park just off Thieves Lane in Hertford (Grid Ref: TL305125). 1: Go through the metal gate in the south-west corner of the car park. 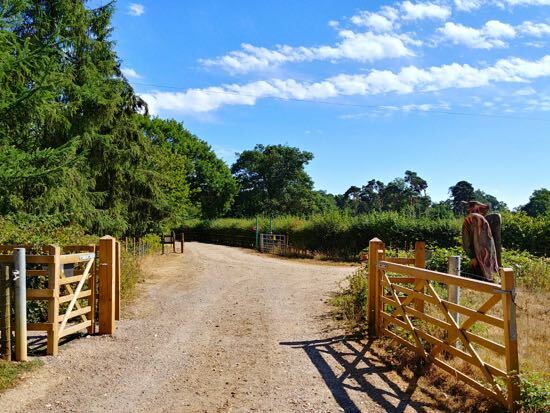 Go through a second gate and take the left-hand path as it heads diagonally downhill across the field in a south-westerly direction leading to the woodland below. When you reach the hedgerow go through another metal gate and turn right heading south-west. You will cross two wooden footbridges before crossing a larger bridge over the River Mimram. At the other side of the bridge turn right. Do not go under the underpass on your left. 2: After turning right you will come to a fork in the path. Take the right-hand fork by going through a gap to the right of the gate. 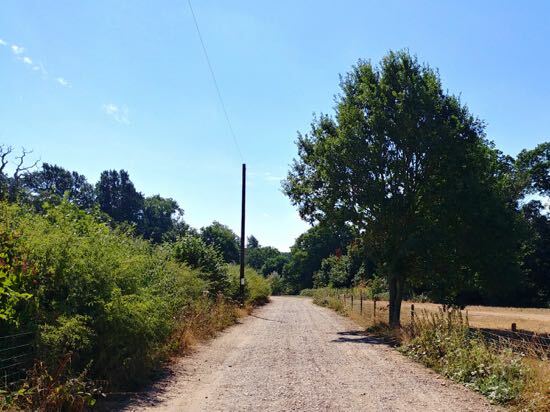 Continue heading west along this track with the hedgerow and River Mimram on your right and the field on your left until you pass Kings Lake on your right. Soon after you will come to a track junction. 3: At this point the walk would have involved taking the track on your left and heading south uphill into the woodland. 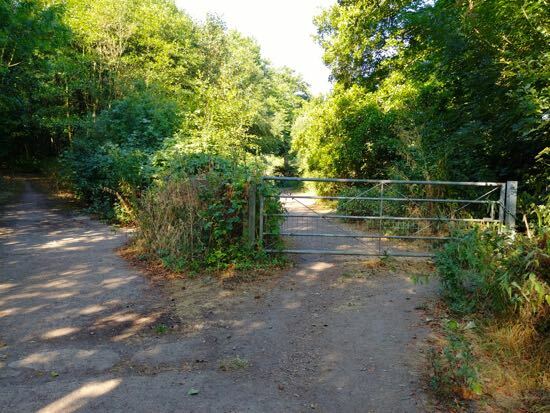 However, in January 2019 a user of this site reported that the section of the walk between points 6 and 7 is currently closed. Until it is open we suggest turning right at point 3 and continuing the walk from point 7 onwards. 7: Walk north-east with Kings Lake on your right, and then north towards Riverside Lake. 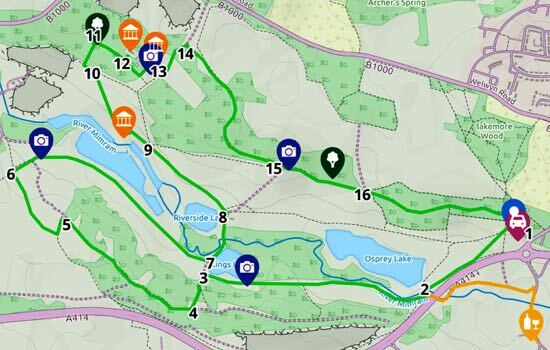 Continue heading north with Riverside Lake on your left until you reach a gate signposted Oak Trail. 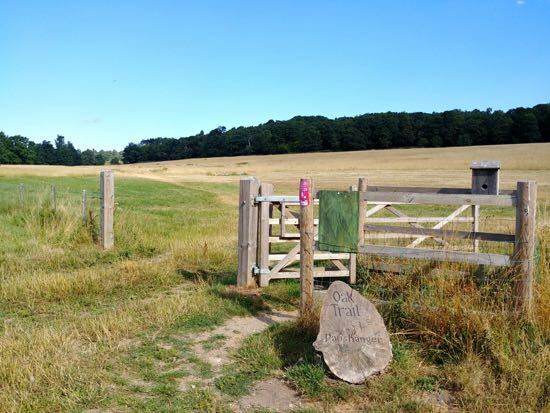 8: Go through the Oak Trail gate and head diagonally to your left as you cross the field heading north-west to the distant gate. 9: When you reach the next gate take the left fork and continue heading north-west. 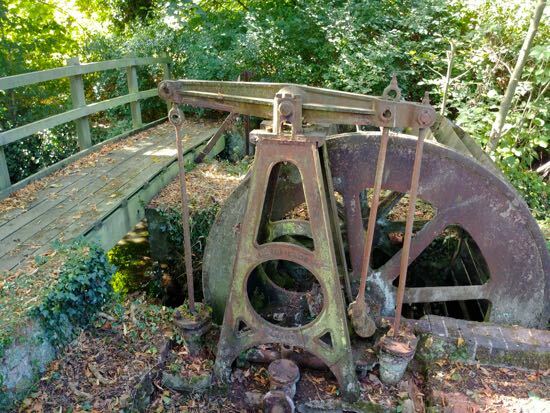 Soon after going through this gate look out for a track that veers slightly to your left and drops through the hedgerow to a 19th century water wheel and Repton's Broadwater - see image below. 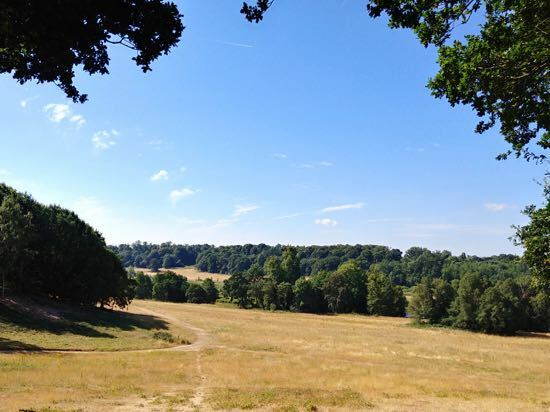 Continue following the Oak Trail as it climbs the hill to the north-west corner of the field. 10: Here you will find a bench with great views; you might just need it at this point. 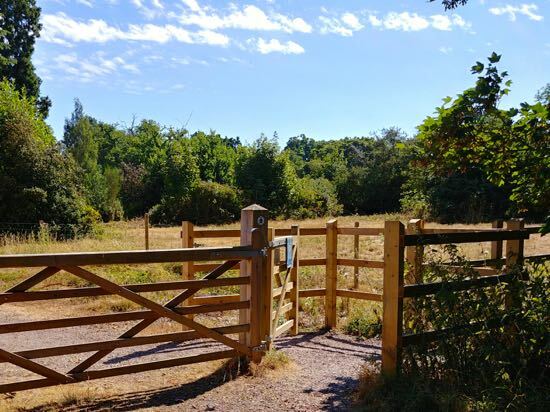 After a sit down turn left a short distance and then turn right into the woodland following the Oak Trail up to a large oak tree surrounded by a metal fence. 11: When you reach the oak, consider taking time to admire this wonderful specimen. A couple of benches have been placed around the site for those wanting to just stop and take in the historical significance of this tree. 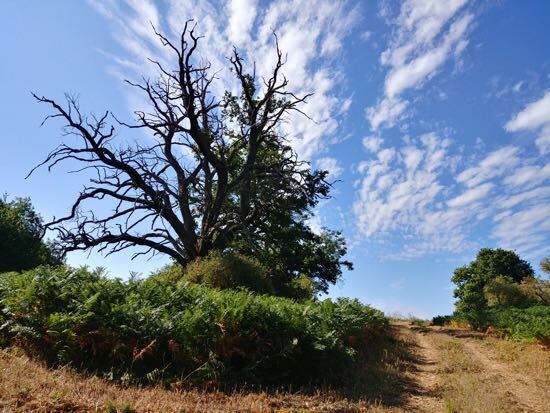 It's estimated to be between 450 and 500 years old, and is thought to have been planted by Queen Elizabeth I. 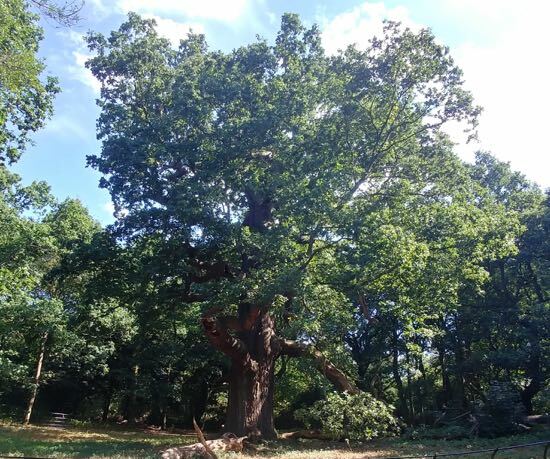 It's said to be the largest 'maiden' or clear-stemmed oak in the country. 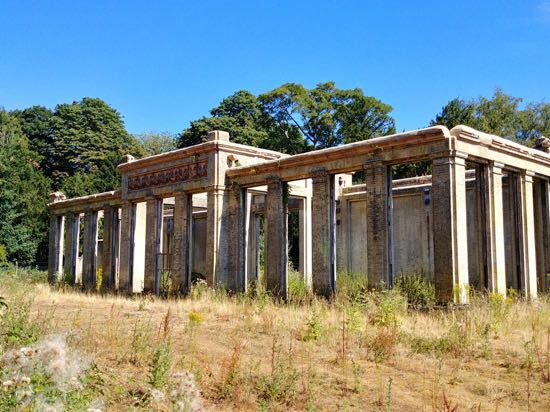 12: Continue following the path round past the tree as the track heads to your left past the remains of the Orangery and then the remains of the foundations of Panshanger House. 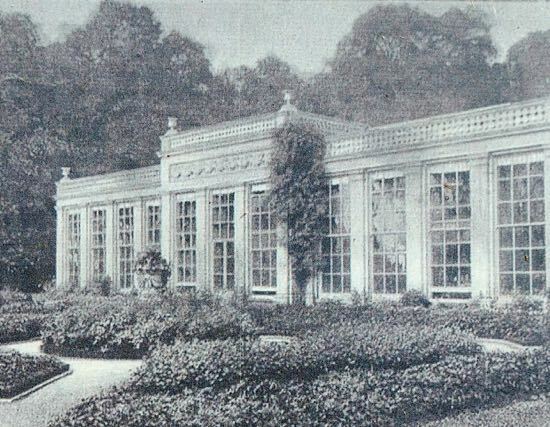 13: Here you will find another bench which offers a view of what would have been seen from the main house before it was demolished. Now turn left and head north. 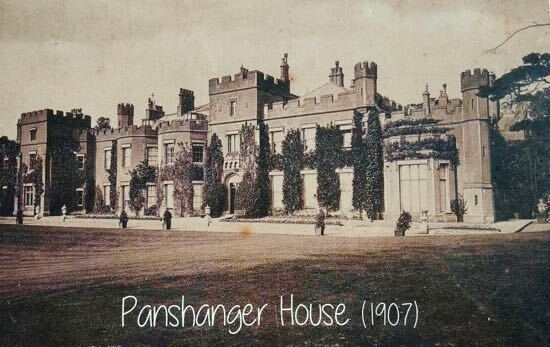 Do not head downhill into Panshanger Park, instead walk towards a gate that leads to one of the exits from the site. 14: Go through the gate and follow the track round to your right. When you reach a second gate close to a large carved wooden bird, turn right down a track which is a 'permissive path'. Follow this track as it weaves south-east through the woodland. 15: The track eventually reaches a junction, but your way is straight ahead continuing to head east. Here you will have a fine view point over the Mimram Valley to the south-east. Also look out for a grand old oak tree on your left. 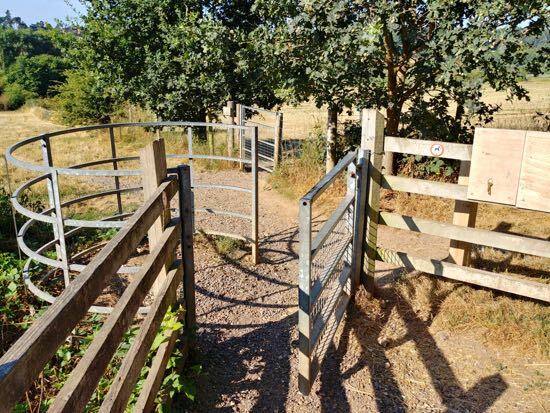 16: You will reach a junction in the track (which is point 5 on our Walk 79: Panshanger Park Short Loop) with a path joining from your left and a gate leading down to the river on your right. Ignore both and continue straight, heading east through woodland back to the car park. Below is an interactive map for those with smartphones and tablets. It enables you to zoom in and access KML/GPX data.